There is something about using lift-the-flap books that draws in children and creates opportunities for engaging language and fabulous therapy sessions. Lift-the-flap books are typically promoted as "baby" books. However, I have found that toddlers and preschoolers are intrigued by these sturdy interactive books with flaps on every page. So why do I love lift-the-flap books? First of all, they are interactive. Early language learners have short attention spans and learn through experiences. They want to touch, feel, and interact with people and objects around them. Lift-the-flap books offer a platform for young language learners to run the show. They are able to shift joint attention from book to adult readers rather quickly. Second, lift-the-flap books facilitate emotional responses to hidden pictures and print in books. Whether it's surprise, excitement, puzzle, or startle, you can model over-exaggerated emotions and mirror and label the child's emotions. Third, lift-the-flap books provide opportunities to teach location and prepositional phrases. 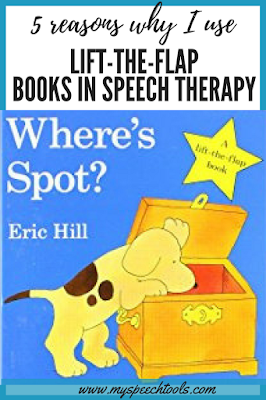 One of my favorite books is Where's Spot? Phrases such as: "under the bed," "in the piano," and "under the stairs" can be used to increase mean length of utterance, teach location, and increase intelligibility of speech with repeated readings. Another reason to use lift-the-flap books in speech therapy is the frequency of repeated and predictable text. Dear Zoo, includes the repeated text, "so they sent me," "He was too ___," and "I sent him back." Early language learners will ask for this book over and over. Finally, there are many wonderful lift-the-flap books available. So whether your child or client is interested in zoo animals, spring chicks, farm animals, fire trucks, or dinosaurs, there is sure to be a lift-the-flap book he will LOVE. Do you use lift-the-flap books in your therapy? Do your clients have a favorite book they ask for over and over? I'd love to hear from you. Comment below and let me know. *(Amazon affiliate links are included within this post). *To purchase gently used copies of books mentioned in this post search Thriftbooks by clicking on the following link:Used books for as low as $3 each (A Thriftbooks affiliate link). If you enjoyed this post, you may also enjoy these blog posts. 10 Speech and Language Goals for "In the Tall, Tall Grass"
Don't forget to sign up for my newsletter below and follow my blog on Bloglovin' or enter your email in the sidebar to receive my blog directly to your inbox. Don't miss a single post.